June 18th through 20th, the Mutual Musicians Foundation hosts an educational music festival celebrating Kansas City swing. On the 19th and 20th, the 26th annual Jazz in the Woods festival in Overland Park’s Corporate Woods offers sets by Najee – who opened this season’s Jammin’ at the Gem series – and Julian Vaughn – who opens next season’s Jammin’ at the Gem series – among others. Those same days, Parkville’s 20th annual River Jam in English Landing Park presents David Basse, James Ward, the Danielle Nicole Band, and plenty more jazz and blues. “A great phenomenal musical organization, that’s all. Tremendous in number, wonderful in ability. Think what it means. A band augmented to sixty pieces with highly developed musicians and two hundred thoroughly trained voices. Great, you say. Why, the heavens will acknowledge such music and such singing from such a band and chorus. “In no place in America can a community boast such a thing on such a magnificent scale. This will probably be the high mark in big things musical. It will work wonders in civic affairs and racial matters. Nothing like music to win love, respect and confidence among the races. If music soothes the savage, it also reconciles the civilized to better race adjustment. All Kansas City will be proud of the Afro-American Band and all male chorus, with N. Clark Smith as master-director. 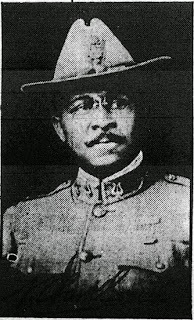 Major N. Clark Smith educated many of the musicians who would create Kansas City jazz. 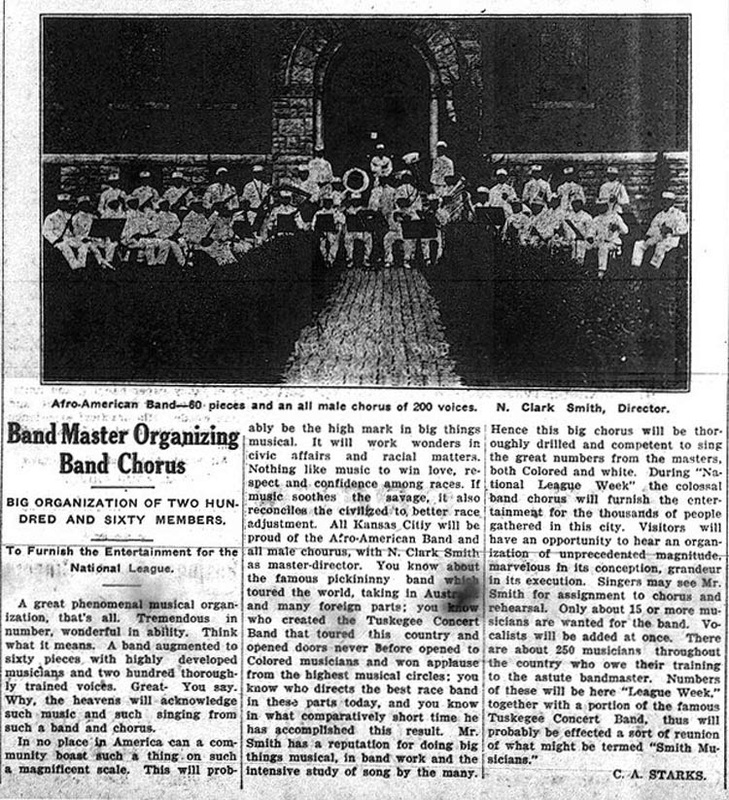 At the time this article ran, he directed the bands at Western University, in what is today Kansas City, KS, and was once the town of Quindaro. But in September, 1916, he would move to Lincoln High School where he trained musicians like Walter Page, Harlan Leonard, Julia Lee, Jap Allen and Lamar Wright, each of whom would play key roles in the development and dominance of Kansas City jazz. 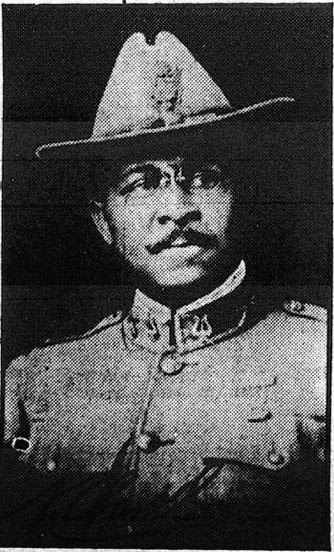 “The coming of Captain N. Clark Smith, who has been elected Commandant at Western University, marks a distinct epoch in the history of that Institution and augurs well for the future prosperity and development of that excellent school. Capt. Clark Smith comes thoroughly equipped with all the necessary training and experience of the successful Commandant and in addition is recognized not only as the greatest bandmaster of the race but the greatest director America has produced since the days of the illustrious Gilmore. 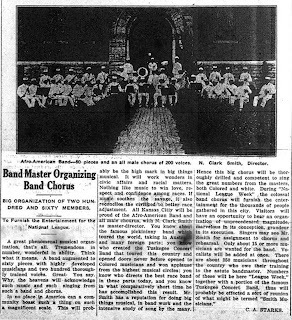 By 1917, Bennie Moten was organizing his first band (B. B. and D., with Bailey Hancock and Dude Lankford). And the Musicians Protective Union Local No. 627 was founded, initially with 25 members. With N. Clark Smith moving to Lincoln High School the previous September, the puzzle pieces that would lead to the creation of a unique style of jazz in Kansas City were starting to fall into place. By 1930, the union would be dedicating its new headquarters at 1823 Highland with 347 members. Among those members were Bill Basie, Bennie Moten – and Walter Page, Harlan Leonard, Julia Lee, Jap Allen, Lamar Wright, Herman Walder and Bill Saunders. In June, 2016, a festival honoring Kansas City swing will be staged at 1823 Highland. At the same time, major jazz festivals will swing Overland Park and Parkville. In June, 1916, a man crucial to why jazz developed in Kansas City was preparing a very big concert. As I wrap up co-editing my first issue of Jam magazine, I have discovered two points: (1) It takes more time than you think it will and (2) I really need to start sooner next time. Both of those points lead to no new blog post this week. The June/July Jam, which should be on the streets on June 1st, is co-edited by outgoing editor Roger Atkinson and me. The August/September issue will be the first for which I'll deserve all the blame. Actually, there's a third point I've discovered about editing the magazine: Despite the work, doing this is a bunch of fun. Two signs of a healthy Kansas City jazz scene stood out last week: A general manager with a track record of success coming to The Broadway Jazz Club and unprecedented donor support for the American Jazz Museum. Since it opened nearly a year and a half ago, the jazz community has desperately wanted to see The Broadway Jazz Club thrive. Not just for the additional opportunities to hear jazz, but because it embraced the concept of a dinner jazz club, a niche unfilled in Kansas City since the demise of Jardine’s. But The Broadway Jazz Club wasn’t located just a little north of the Country Club Plaza, Jardine’s onetime neighborhood. It was in Midtown. You didn’t see Nichols Fountain as you approached Broadway. You saw a Sprint store with bars on its windows. Plus, the success of Take Five Coffee + Bar meant Johnson County jazz fans no longer needed to drive into town for dinner and jazz. Some of the best music is now in their back yard. The club closed for the first couple weeks of January for upgrades. It reopened with a clearly diminished music budget, mostly duos and trios, largely comparable to the jazz that not-a-jazz-club The American Restaurant booked. You could hear complete bands at the Green Lady Lounge, at The Blue Room, at Take Five. There were exceptions, but too often The Broadway Jazz Club felt like listening to a pianist with a brass or woodwind player on a stage and in a room intended for much more than that. Recently, Green Lady Lounge proprietor John Scott has quietly consulted with the owners of The Broadway Jazz Club. Scott knows the area. Before Green Lady, he owned a gym – still operating, with a different owner – in the rear of the faded strip mall across the street. And he grasps how to run a neighborhood club spotlighting jazz. In the last year and a half he has opened a second stage in Green Lady’s basement level while tripling the club’s revenues. Starting June 1st, John Scott takes over as general manager of The Broadway Jazz Club. After a couple of weeks closed for adjustments, Broadway will reopen as Broadway Kansas City. Initially, the club will operate just Thursday, Friday and Saturday nights, and Wednesdays when the 12th Street Jump radio program records there. Broadway will be less the-second-coming-of-Jardine’s and more a club which embraces the neighborhood Scott understands, but with the live jazz he adores. He envisions a bigger sound to fill the room, tighter shows, and the same professional presentation that is a hallmark of Green Lady. It’s wrapping Kansas City’s heritage in a more appealing light and comprehensively branding it with a different feel than you’ll find in Johnson County. Not better, not worse, but unique. And if you want to sample this style of unique, you’ll need to come into Midtown. The jazz community hasn’t felt this excited about the future of Broadway since it opened. We can feel equally excited about the future of the American Jazz Museum. With proposed cuts to its city funding half restored – museum supporters have always done an exceptional job of raising a ruckus at City Hall – last week the museum announced record private donations. Its fifth annual PEER Into the Future fundraising lunch on April 20th attracted nearly 240 guests and raised more than $112,000 in private donations. Add over $128,000 in donations prior to the luncheon and the museum has so far raised over $240,500 for general operations. That’s extraordinary. Don’t kid yourself. There’s an elephant in the Kansas City jazz room, and it’s the American Jazz Museum. You can criticize elements of the museum. It should be larger. The permanent exhibits need to evolve to entice repeat visits. But recognize that they do a superlative job of fundraising, better than any other Kansas City jazz organization in the thirty-plus years I’ve known the scene. The museum is a central player in KC Jazz ALIVE, an organization working to bring together a too often divided jazz scene, with too many organizations and every group out for itself. Separately, club owners are talking with each other. The owners don’t see themselves as competitors, but as crucial to maintaining a thriving audience for jazz. Yet, there’s an outlier which appears intent on moving its own direction and not working with others in the jazz community. The Mutual Musicians Foundation is unquestionably the most historic building and institution in Kansas City jazz. They are educating school age music students at no charge each Saturday morning. They are sponsoring an educational jazz festival centering on KC swing next month. If they can raise the money to erect a tower and begin broadcasting by June of next year, they will be home to this city’s only jazz radio station. The Foundation is no relic. It is sponsoring vital programs. But the Foundation declines to participate in the unity enveloping the rest of the jazz community. The organization chooses to estrange itself despite other groups repeatedly reaching out to its members. The rest of the jazz community is not competing with the Mutual Musicians Foundation. On the contrary, I repeatedly hear how this community wants to embrace the Foundation’s history and help celebrate its successes. More than that, I suspect some of the same donors who have supported the American Jazz Museum will also wrap their financial arms around the Foundation when it moves beyond presenting itself an an aggrieved institution. Because supporters of Kansas City jazz are recognizing that the scene flourishes most when we work together. No post this week, and perhaps the next week or two, as I begin to co-edit the next issue of JAM magazine and discover this is going to take more time than I thought and I really should have started a couple of weeks ago. I foresee late nights and an abundance of daytime yawning in my near future.